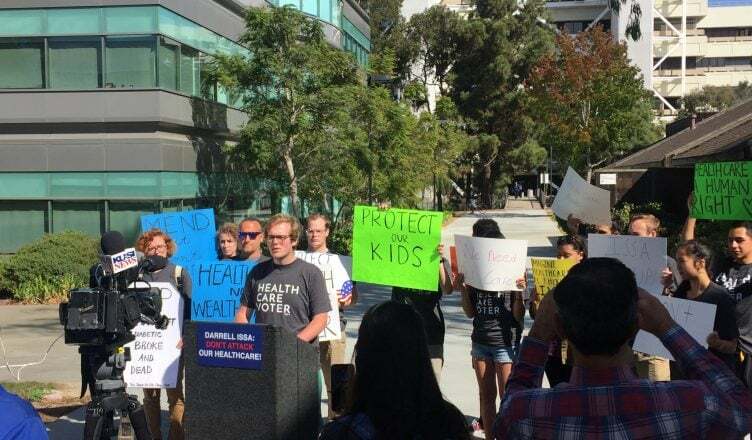 Members of the SoCal Healthcare Coalition and their supporters rallied for healthcare in front of Club Med on Thursday. The marchers held dozens of posters provided by SCHCC with statements in favor of affordable health care, including “Healthcare NOT Wealthcare,” “Protect Our Kids,” “Issa Step Up!” and wore T-shirts reading “Health Care Voter” to keep the rally’s message direct and simple. The purpose of the demonstration was to reach out to U.S. Representative Darrell Issa (R-Calif.) who represents UC San Diego and other parts of San Diego. The marchers wanted to make Issa aware of what their stance is regarding President Trump’s executive order to push Americans into “junk” insurance plans and cut funds for healthcare, which was officially announced that same morning. In response to Issa’s proposition to cut funding for healthcare by up to $74 billion, one of the questions the marchers wanted to ask was how people will be able to secure their financial futures if healthcare is not made to be affordable. Eric Dean, a Navy veteran, shared his story with the UCSD Guardian of a time when he was attacked on the street by a group of men and needed to get five stitches for his eye injury, but the cost of those five stitches almost left him bankrupt. Dean emphasized how his situation is something that could have happened to anyone; it is not always something that people can control, and the violence of strangers in the world should not affect his financial future to the point of bankruptcy. The spokespeople at the rally stated that the decision against affordable healthcare was cause for “emergency action,” because the executive order by Trump is something that affects people’s healthcare nationwide. They noted that they are demanding protection for their healthcare and wanted to organize an event that could bring people together to show that they are concerned about their healthcare. The rally lasted approximately one hour and was peaceful throughout.